It’s well known that Gareth Bale has taken up a more central position at Spurs as of late, a result of AVB seemingly giving him a ‘free role’ in the starting XI. 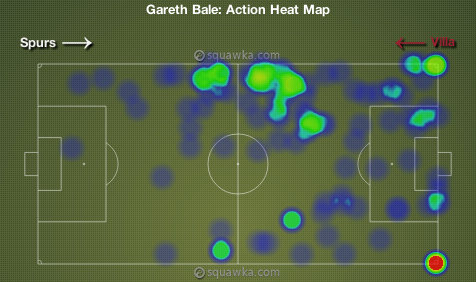 Heat maps from his previous 2 Premier League appearances demonstrate how Bale has made the shift away from his more natural left sided position, and is now a truly free roaming attacker. The trend on the heat maps against Liverpool and Fulham are consistent throughout the second half of this season, but differ greatly when a comparison is made to Bale’s positioning during games from earlier in the season; such as in the 2-0 win against Aston Villa in October 2012. When looking at his stats from the latter half of the season, Bale’s evolution from a wide man to a more central attacking player can be shown to have had a positive effect on his attacking potency. 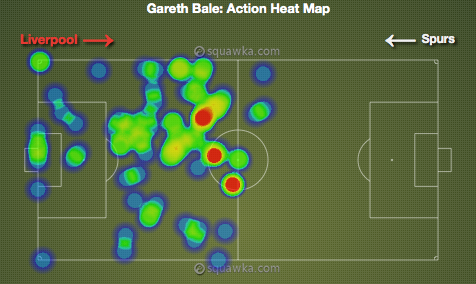 In Bale’s first 15 games of the season, he had 59 shots at goal in total, equating to an attempt every 22.5 minutes. However, during those 15 games the Welshman scored just 6 goals, initially seemingly a respectable tally but it appears a tad low in comparison to the 10 goals he has scored in his last 11 Premier League appearances since. In those last 11 league appearances, Bale has had 67 shots at goal, an average of one every 14.7 minutes – meaning he has an attempt on goal 34.6% more frequently than he did during the first 15 games of the seasons. 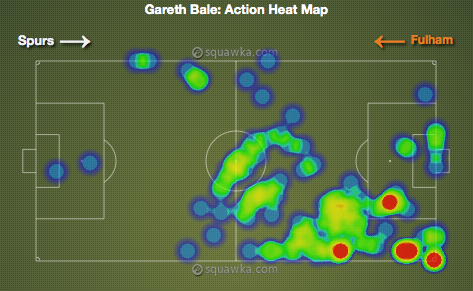 This clearly highlights Bale’s development into a more attacking threat. For comparison; Suarez has averaged a shot every 22 minutes, van Persie every 26.9 minutes and Demba Ba every 25.6 minutes – Bale outshoots all 3 of these strikers in the second half of the season. With Bale’s attacking play seeing such an improvement it might be expected that another strong area of his play, chance creation, might have been negatively affected. However, this hasn’t occurred; in fact Bale has created a chance more often in his previous 11 appearances (1 every 32 minutes), than he did in the 15 games before that (1 every 37.4 minutes). These statistics show that not only has Bale become a greater attacking threat in terms of attempts on target, but he also increased the number of chances he creates; a vital attribute for any effective attacking player. Bale’s evolution into a more central attacking player has obviously greatly benefited Spurs; without his goals this season we would have 18 fewer points, and consequently without those points we would be 10th place in the Premier League. Spurs have also not won a game without Bale scoring since New Years Day, a run of 15 games. Only time will tell if his development into a central attacking player will continue in the long term or if he will revert back to his left sided position once players such as Holtby break into the side, but for now I think every Spurs fan can agree that they are delighted that Bale has developed into the attacking threat he is today, especially when considering the awful form of strikers Adebayor and Defoe.